I am on annual leave at last (hooray!) and it’s time for another long-overdue update. It’s been a very busy few months, mainly taken up by working on two books (!) and being involved in a number of events. 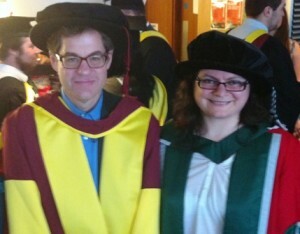 Dr Andrew Higgins graduated in July. Very proud of him! First things first: together with Andrew Higgins, I have been working on a scholarly edition of a series of manuscripts by J.R.R. Tolkien on the invention of fictional languages. Tolkien connoisseurs will be aware of Tolkien’s essay ‘A Secret Vice’, which was first published in The Monsters and the Critics and Other Essays, edited by Christopher Tolkien, in 1983. Our book will be a new, extended edition which will reveal significant new material by Tolkien and will be accompanied by a substantial introduction and commentary. The book is scheduled to be published by HarperCollins in February 2016. You can pre-order the book from Amazon here… and here’s the link to the HarperCollins page. This book necessitated a few visits to Oxford to consult Tolkien’s manuscripts. 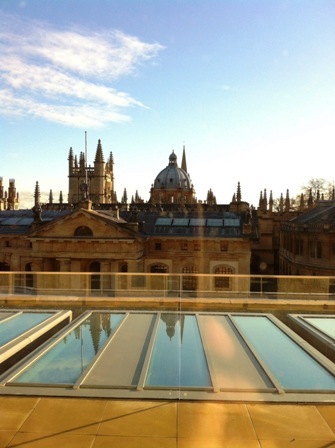 It was lovely to work in the newly refurbished Weston Library (previously known as the New Bodleian Library) where Special Collections (including the Tolkien material) are held. Here is a photo of the spectacular views from the top of the building. The second book I have been working on is a research monograph, tentatively titled Celtic Myth in Contemporary Children’s Fantasy and under contract with Palgrave Macmillan as part of their Critical Approaches to Children’s Literature series. I should be done by Christmas and the publication date will be at some point next year. The book explores the ways contemporary children’s authors have rewritten, revised and adapted Irish and Welsh medieval sources to reveal matters of identity and ideology. Children’s authors I discuss include Alan Garner, Susan Cooper, Lloyd Alexander, Jenny Nimmo, Pat O’Shea, Kate Thompson, and Henry Neff. While working on this monograph, I have already shared initial and interim findings in my research-led teaching and in conference papers and talks: first, my Masters course for the Mythgard Institute in Spring term 2014 (Celtic Myth in Children’s Fantasy); second, a number of sessions of my Year 2 undergraduate module Monsters, Cyborgs and Imaginary Worlds; third, my talk at the Centre For Lifelong Learning at Cardiff University in June (“Welsh heritage for teenagers: Re-writing the ‘Mabinogion’ in Alan Garner’s The Owl Service and Jenny Nimmo’s The Snow Spider”); and, fourth, my recent paper at IMC Leeds in July on “‘Celtic’ Myth and Celticity in Lloyd Alexander’s The Chronicles of Prydain” (see below). 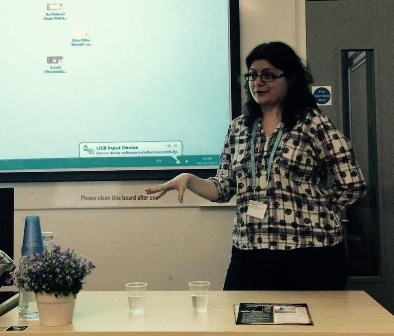 In other research news, I gave a paper for the “Enchanted Edwardians” conference organised by the Edwardian Culture Network and the University of Bristol. My paper was on “Kipling and Tolkien and their ‘mythologies for England’”. This was a wonderful conference with excellent papers and an outstanding keynote lecture by the inimitable Professor Ronald Hutton. What a treat! The second main conference of this academic year – as per the hint above – was the International Medieval Congress at Leeds. I organized two sessions on Tolkien and I gave a paper for a third session. 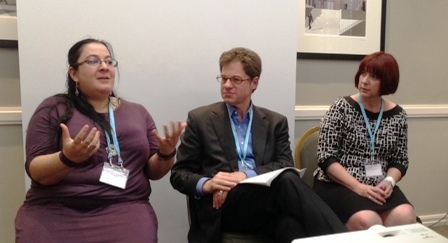 My first Tolkien session focused on “things Celtic” and was aimed specifically at early career researchers who contributed exciting new work in Tolkien studies. 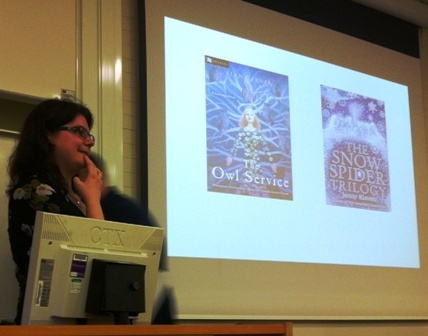 Aurélie Brémont and Kris Swank tackled Tolkien’s Irish sources, especially the immram genre, while Andrew Higgins talked about Tolkien’s earliest uses of the Welsh language. My second Tolkien session was a roundtable discussion with Professor Nick Groom, Dr Mark Atherton and myself: we discussed “new” Tolkien publications, focusing mainly on The Fall of Arthur and Tolkien’s Beowulf translation and commentary. 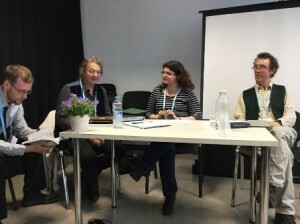 My paper was given for a different session, organized by the Tales after Tolkien Society. I talked about Lloyd Alexander’s Chronicles of Prydain, particularly his use of dubious “Celtic” sources and his construction of a sense of “Celticity” which is at odds with modern scholarship. This paper was part of my research for the book I am working on at the moment. Leeds was generally wonderful – lots of brilliant sessions, many friends and colleagues to catch up with, lots of medieval crafts and re-enactments, and an impressive book fair. I was particularly chuffed to buy a very affordable copy of the late Professor Rachel Bromwich’s edition of Trioedd Ynys Prydein: The Triads of the Island of Britain – a book that I previously hadn’t been able to find for less than £200 anywhere! A full posting on the Leeds sessions I was involved in can be found here. Also, for another, comprehensive blog post by Gerard Hynes (who kindly chaired the roundtable discussion I organized) see here. Meanwhile, all sorts of other things have happened. I have reviewed the newspapers for BBC Radio Wales a couple of times; I read an extract from The Lord of the Rings for Tolkien Reading Day 2015 (this year’s theme was ‘friendship’); and my work was featured in Anna Smol’s blog as part of her “Talks on Tolkien” series. 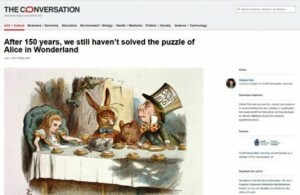 Also, I authored a new article for The Conversation on the occasion of the 150th publication anniversary of Alice’s Adventures in Wonderland, focusing on the book’s appeal and its openness to interpretation: “After 150 years, we still haven’t solved the puzzle of Alice in Wonderland”. I am off to Oxonmoot in September, to give a paper on construction of childhood in Tolkien and meet friends and colleagues, of course! Drop me a line if you’ll be there! Also, Kalamazoo and Leeds deadlines are coming up, so watch this space for potential sessions and papers for next May and July respectively!